One of the most difficult problems when generating the stereo from 2D+Depth is the presence of semi-transparent boundaries between foreground objects and highly-textured background. 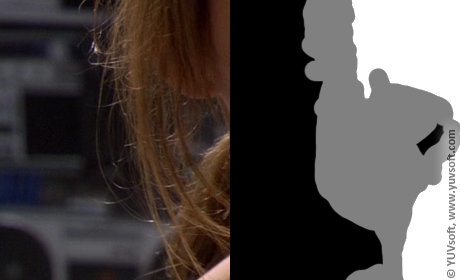 While receiving depth maps for scenes with hair or fur it is impossible to consider each and every hair and manually set the transparency of the boundary region. However, if not to split foreground objects and background correctly, this may give slightly visible artifacts (such as stretch or haloes around objects) on the stereo. Therefore, semi-transparent areas processing is a very important step for obtaining high-quality stereo content. YUVsoft Matting plugin for Adobe After Effects is aimed to handle shots with blurred and translucent boundaries between foreground and textured background and is available as a part of Stereo Generator Suite. Matting plugin uses trimap video sequences to define the area for work. Trimap is a kind of gray scale image that contains only three colors. 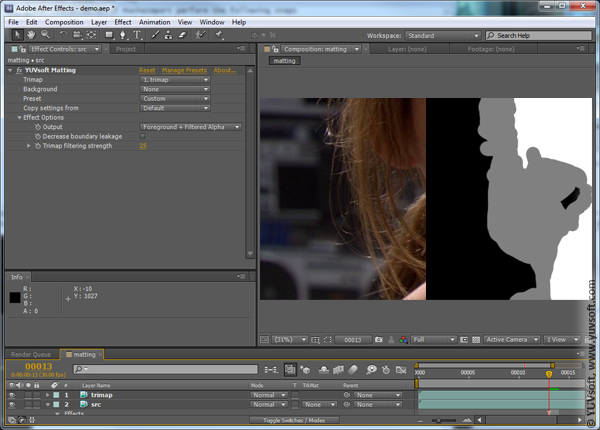 Background areas are marked with black, foreground object is white and an area with complex boundaries has gray color. The last ones are usually a mixture of pixels from object and some texture behind it. Matting algorithm uses special approaches for estimating real foreground and background color and provides an alpha channel and accurately separated foreground object on the output. An alpha map can be used for Background Reconstruction plugin and for the whole process of stereo generation. Alpha channel provides proper overlay of foreground objects and the reconstructed background when generating left and right views, thus eliminating halos and stretch artifacts on the resulting stereo mate. Matting plugin provides the ability of input trimap correction: the area or a complex boundary may be decreased to become more suitable for the current frame. Two pass mode allows to use an alpha channel obtained after the fists pass as a trimap for the second one for making the result more accurate. 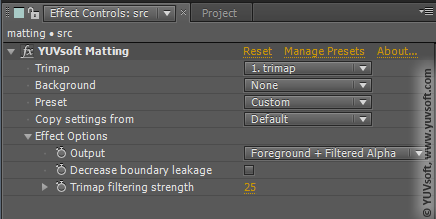 Another interesting feature that helps to provide high-quality results is the Use estimated background option. It is much easier to decompose points on the boundaries if the background area (clean plate) is already provided to the algorithm. The base inputs for YUVsoft Matting are source and trimap video sequences. Two possible variants of an output can be defined: filtered trimap (for parameters adjustment and as input for Two pass mode) and foreground+alpha channel.